A year ago from this day, in fact on the anniversary exactly, I posted a review of the Labyrinth Wisdom oracle cards by Tony Christie. That oracle deck remains as one of my favorites. They’re powerful and insightful for personal readings and great as an addendum or clarifying reading to a professional tarot session with a client. Now I get the pleasure of reviewing the companion book to Labyrinth Wisdom— Labryinth: Your Path to Self Discovery. I’ve always been fascinated by the metaphor of the labyrinth and the rich history that it comes with, so I have read many books on the subject that I can compare with Christie’s. In that comparison, Christie’s book comes out on top. The explanatory power that these 267 pages plus an extensive bibliography for further reading is just incredible. If this is a topic that intrigues you the way it does for me, get Labryinth. It will deepen your knowledge and understanding of the subject area. We begin with clear definitions of what a labyrinth is, types of labyrinths, and its origins. The labyrinth, in short, is a symbol of your journey in life with its twists and turns as you make your way toward your personal center. It can also be used as a form of divination meets walking meditation: journey through a labyrinth with a specific question in mind, and the labyrinth takes on the symbolic meaning of that question. Christie gets into distinctions between classical and Chartres labyrinths, and the history of magic and mysticism behind medieval, Baltic, and Roman labyrinths, among many other types. The comprehensive literature provided on the labyrinth’s history was also a fascinating read for me. Of course, he also gets into the mythology, in particular the Minotaur and the Cretan labyrinth. The book has a definitively practical component as well. There are exercises that guide you to draw your own labyrinths, structured like a drawing how-to book, with step by step illustrations to design your own and then how to use it. There are also tips on how to create a physical structure or delineation– a walkable labyrinth that you make out of stones, or paint, or markings on the ground. Then the anatomy of a labyrinth is broken down for you– the nodes, crosses, and quadrants. There’s the Ariadne’s Thread, which is the single line along which you walk from the outer ring to the center. There are the circuits and the turning points, and how different quadrants of a labyrinth have different metaphysical correspondences. As you journey through one quadrant, it’s the social and cosmic consciousness; through another, it’s mythic and intellection; through yet another, it’s psychic and territorial; and through the fourth, security and pleasure. There’s also a spiral sequence with nine corresponding points, with Point 1 near the entrance, Security, all the way inward to the final Point 9, the center, which is Spirit. 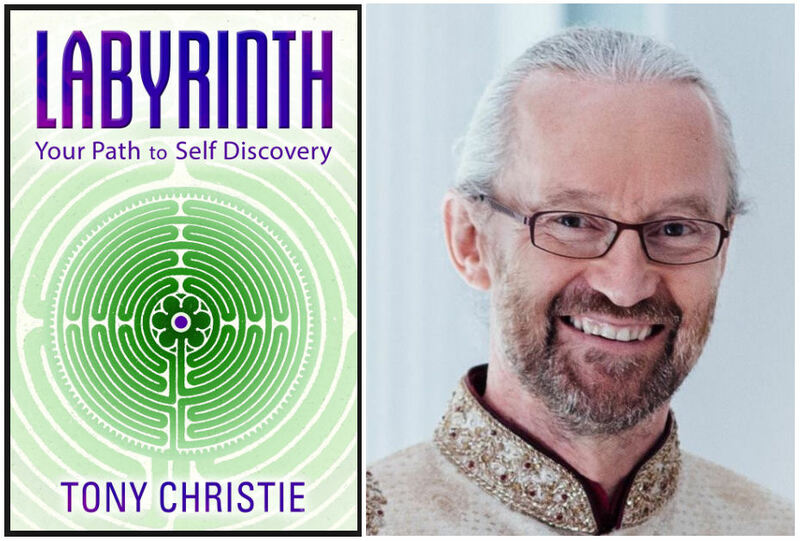 Christie gives a comparative study and draws analogy between labyrinth wisdom and Taoism, mandalas, the alchemical symbol of Squaring the Circle, how it relates to DNA, and also, the labyrinth and the Kabbalistic Tree of Life. The significance of the Sacred Seven in alchemy, astrology, and how it is interconnected to the labyrinth architecture is an enlightening read. There are design blueprints for using the labyrinth to create your own sacred space and invocations associated with each step of the design. Correspondences between the internal chakras and labyrinth design are given. The four elements and how they’re represented in the labyrinth are also explored. Basically, this book left me with so much knowledge I didn’t even know I didn’t know. The exercises and notes for reflection set out an educational immersion for you if you read through this book cover to cover. Different expressions of Journey as symbolized in the labyrinth is discussed: the Mithraic Journey and the Alchemical Labyrinth Path, the Melchizedek’s Labyrinth for healing, to name a few. There’s an entire chapter devoted to the exploration of the labyrinth as a symbol of death and rebirth, of how to use it to release and let go of our negative attachments. Then, by extension, the labyrinth is also a symbol of past lives and reincarnation, which a subsequent full chapter delves into. Finally, my favorite: the tarot and the labyrinth. Christie’s book goes into great detail, spanning multiple chapters and reference charts, on the tarot and the labyrinth. He expounds on the 22 pulse points in a labyrinth that correspond with the 22 Keys of the Major Arcana, and how walking the labyrinth is symbolic of the Fool’s Journey. The labyrinth is a portal, and a portal for mystics of every stripe to better understand. I highly recommend acquiring Christie’s book for your personal library. Occultists are going to love applying all the principles learned from the text. It’s a well-researched, comprehensive, and expansive book on a cornerstone subject matter in mysticism, no matter your esoteric leaning. I can all but guarantee there is a powerful way you can integrate labyrinth work into your craft and that Tony Christie’s book has a section on how you can do just that. Crop circles, magic squares, Hindu mysticism, astrology, alchemy, ceremonial magic, and the interconnection to labyrinths are covered, concluding with an appendix of indispensable reference charts. I cherish my copy of Labyrinth. Yes, I received this book free for prospective review, but even if I hadn’t, I would have purchased it. Tony Christie’s depth and scope of knowledge on the subject is just unparalleled. Not to mention, now that I’ve read the book, I return to working with his Labyrinth Wisdom oracle cards with a much deeper, more comprehensive, dare I say even more cosmic understanding of how to work with the deck. This is one of Llewellyn’s best, for sure. FTC Disclosure: In accordance with Title 16 of the U.S. Code of Federal Regulations Part 255, “Guides Concerning Use of Endorsements and Testimonials in Advertising,” I received Labyrinth: Your Path to Self Discovery from the author for prospective review. Everything I’ve said here is sincere and accurately reflects my opinion of the book. Sounds like a fascinating read! I have thought about the different labyrinths and their portrayals in mythology. Once labyrinths were these mazes that heroes lost themselves in, but over time they appear to have become “simpler” in design. I believe this simplification of the labyrinth correlates with the understanding of the physical world, just as it has also become much harder to develop our spiritual selves.